If a sports hall has final exit doors to the outside it is a requirement of the British Fire Alarm Standards that these doors should have a call point / break glass unit positioned next to them. This however puts them at risk from damage from the sporting activities which will take place within the sports hall. At The Safety Centre we have specialist products available specially designed to protect the devices from damge. For more information about Break Glass Cover For School Sports Hall call us NOW on 01200 428 410. The Break Glass Covers are designed to provide a physical barrier between the call point unit and the potential damaging factor, such as a person or a ball. They are available in various sizes and with a variety of mounting options, depending on whether your break glass units are flush or surface mounted. Within this range there are also variants available with integral sounders. These covers are designed to help prevent malicious activation of the call point underneath the cover. This works by emitting an alarm siren when the cover is lifted to gain access to the break glass unit. 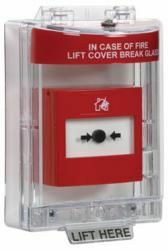 Along with the break glass covers we also have cages and protective enclosures available for other equipment that may be installed in vulnerable areas within a sports hall, such as smoke detectors, sirens / sounder and light fittings. If you’re interested in these products you may also be interested in our STI6400 and Call Point Test Key ranges.